This is a really cool and hardly-used feature that can be super useful for keeping everything organized. Gmail will still deliver any emails that you send to contact+XXXXXXXXX@myphotobiz.com to your account, where XXXXXXXXX can be anything you want it to be. So you could create a filter for all email sent to contact+read@myphotobiz.com that skips the inbox and adds the label “read” so that it shows up in the “Vendors & To Read” Inbox. You’d then use that email address when signing up for newsletters or other stuff you’d like to have but don’t need to see immediately. You could also use it on your contact form and create a filter that puts a star next to every new inquiry that comes from the contact form on your website. Note: This only works for the primary email address you use to sign in to Gmail. It doesn’t work with the other emails that you manage within the same Gmail account, which is kind of a bummer when you manage multiple emails in one place. Send yourself an email to try it out – it’s really swell. Do you find yourself writing the same email over and over again? This is where Canned Responses come into play. Canned Responses allows you to save an email that you send often and paste it into your current email so it can be customized, personalized, and used again and again with your clients. For example, I have emails saved that I send to all my new inquiries, to all inquiries that I am following up to, and for sending out payment reminders. To create a canned response, start composing a new message. Once you have the email written, go to canned responses and select “New Canned Response….” under Save and it will save your response. To use it in the future, start a new email (or reply to an email), place your cursor where you want to add the canned response, click “Canned Response” and select “Insert” and the name of the response you want to add. You can then edit it as needed. I highly suggest using at least one or two personalized notes at the start or end of an email and customizing them as needed so that they don’t sound generic, because being generic will only hurt your business. If you aren’t already following us via email, sign up for our email updates using the “+” tip above and see how it works. It’s a great way to make sure you get all the posts from our website and hear about what’s happening behind-the-scenes with The Modern Tog. 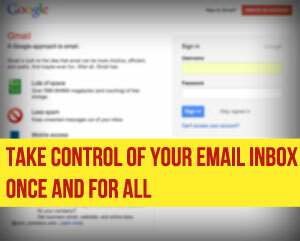 Tomorrow we’ll be looking at the last big tool that you need for really getting your email under control. This tool is amazing for keeping track of emails that need to be followed up on at a later date, and is invaluable to me in client management.